In the year 313 AD, St Constantine the Great signed a law decreeing freedom of religious faith. His co-ruler, Emperor Licinius seconded this law; however, in the provinces subject to him, the persecution of the Christians continued as before. In the year 320 AD, these holy Martyrs, who came from various lands, were all soldiers under the same general, who tried to force them to bring a sacrifice to the idols, which they refused to do. Taken into custody for their faith in Christ, and at first interrogated by cruel means, they were then stripped of their clothing and cast onto the frozen lake which is at Sebastia of Pontus, at a time when the harsh and freezing weather was at its worst. This torment was made moire difficult for them, since a warm vapour-bath was placed on the shore of the lake to tempt them to leave the freezing water. They endured the whole night naked in such circumstances, encouraging one another to be patient and singing holy hymns to God until the end. He that guarded them, named Aglaius, who was commanded to receive any of them that might deny Christ, had a vision in which he saw heavenly powers distributing crowns to all of the Martyrs, except one. The one who abandoned the contest hurried into the bath, but as soon as the warm air touched his body he died. Seeing this, Aglaius professed himself a Christian and joined the Martyrs on the lake, and the number of forty remained complete. In the morning, when they were almost dead from the cold the torturers broke the martyrs' shins with mallets and cast them into fire, after which their remains were thrown into the river. Three days later, the torturers came to Bishop Peter of Sebastia and recounted their deeds. Bishop Peter gathered the bones of the martyrs and buried them with honour. 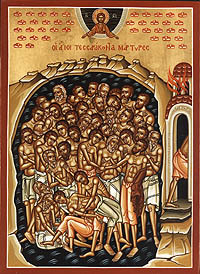 Thus they finished the good course of martyrdom in 320, and their names are: Acacius, Aetius, Aglaius, Alexander, Angus, Athanasius, Candidus, Chudion, Claudius, Cyril, Cyrion, Dometian, Domnus, Ecdicius, Elias, Eunoicus, Eutyches, Eutychius, Flavius, Gaius, Gorgonius, Helianus, Herachus, Hesychius, John, Lysimachus, Meliton, Nicholas, Philoctemon, Priscus, Sacerdon, Severian, Sisinius, Smaragdus, Theodulus, Theophilus, VaIens, Valerius, Vivianus, and Xanthias. We plead to You for the sake of the sufferings of Your Saints which endured for You, 0 Lord, and heal all our pains, we pray, 0 Friend of man. Having left every military array of the world, you cleaved to the Master Who is in the Heavens, 0 Forty Prize-winners of the Lord; for having passed through fire and water, 0 blessed ones, you rightly received glory from Heaven and a multitude of crowns.